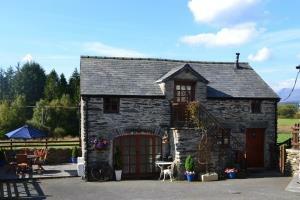 Llannerch Goch Luxury Cottages Self-cateringACHIEVED 5* RATING ON TRIP ADVISOR. If you’re tired and need a break, pack your suitcase, escape to the country, leave behind the hustle and bustle of daily life and head for a relaxing break at one of our luxury cottages. You'll be breathless standing still with our views. Tryfan 5* Cottage - Contemporary in style on one level, king size bed with Jacuzzi en-suite and a twin shower en-suite. Patio overlooking the Snowdonia Mountain range. Ideal for al-fresco dining. Siabod 5* Cottage - Traditional in style with farmhouse kitchen, king size bed with a roll top bath en-suite and a twin with shower en-suite. Patio overlooking the Snowdonia Mountain range. The Old Coach House 4* Cottage- A 17thC oak-beamed cottage with character, lovingly renovated. Spectacular views in the heart of Snowdonia National Park. Bring your dog for £25 per week. We are centrally located in the Snowdonia National Park within easy reach of the Snowdonia Mountains and Coast. Ideal location for that well deserved romantic break where you can spend quality time together in a rural retreat where you can forget the pressures of everyday life! Llannerch Goch has recently been given a Sustainable Tourism Business Award for Promoting Language and Culture by the Snowdonia Society. The picturesque village of Betws-y-Coed is just 2 miles away and the market town of Llanrwst 3 miles. Llannerch Goch is located within a varied landscape of mountains, woodland, lakes and rivers in beautiful countryside steeped in mystic Celtic history. It is an ideal location for visiting National Trust properties, and the nearby Capel Garmon neolithic burial chamber. We have many Restaurants and a Bistro in Betws-y-Coed, popular for fine food and an emphasis on local produce. Staying in the Conwy Valley offers plenty of opportunities for those who enjoy outdoor activities of all kind. For those who enjoy walking there are walks of all grades of difficulty ranging from mighty Snowdon which has its own mountain railway to the more leisurely walks in the nearby Gwydir Forest and the valley floor. ACHIEVED 5* RATING ON TRIP ADVISOR. Free Wi-Fi. Pub within walking distance serving local Real Ales. Fine dining at our local Bistro serving locally produced food 2 miles away. Bring your dog to The Old Coach House for £25 per week. Children welcome from any age. Tryfan + Siabod Cottage 3 steps. Sensor lighting upon approach Car Park immediately outside each cottage Assistance for portering of luggage is available upon request Timetables for trains and buses are available in the Welcome folders Central Heated and Double Glazed throughout Ground floor bathroom, living room and bedroom available. Please log on to our own Website www.betwsycoed.co.uk for full Access Statement.